DPAA Director Mike Linnington and his team kicked off 2016 with a Regional Meeting in Los Angeles for MIA family members, and by all accounts it was a success. DPAAs global accounting mission encompasses 83,000 missing personnel; however, many are believed to be unrecoverable because of the circumstances surrounding their deaths, such as going down with a ship or aircraft in deep water. Geographically, 75% of the losses are in the Pacific. WWII poses the biggest challenges, namely because of the sheer number of MIAs unaccounted-for, totaling 73,000. Many of the cases are incomplete or inconclusive and lack DNA reference samples on file. However, with DPAA having been given the official go-ahead to partner with outside organizations, WWII recoveries are expected to increase this year, especially in Europe. While the number of unaccounted-for MIAs from the Vietnam War is relatively small at 1,624, of which approximately 539 are believed unrecoverable, DPAA is concerned about the rapid degradation of remains and will increase operations in FY 2016 that will hopefully speed up recoveries/identifications. 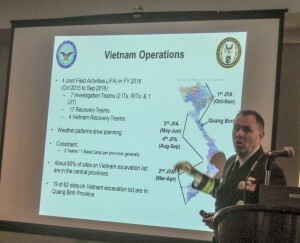 LCDR Michael Rancour, U.S. Navy, is a DPAA Southeast Asia Analyst, shown here describing FY 2016 Vietnam field operations. The schedule looks good — let’s hope the weather does, too. Most of the remaining cases in Vietnam involve downed aircraft in locations such as the Central Highlands, where my first husband’s F-4 was shot down. The jungle flourishes in that area and camouflages the rugged, remote topography — as well as the crash sites, requiring special teams to investigate and excavate. 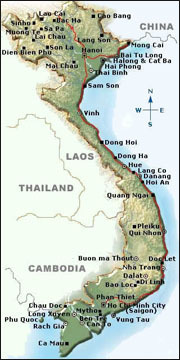 Laos will also see an increase in operations, but like Vietnam, weather is a concern. But unlike Vietnam, the Lao are the least flexible to changes. The Korean War is not the forgotten war, thanks to families, veterans and the South Koreans, who have been sponsoring Korean visitation programs over the years for American veterans who served in Korea. 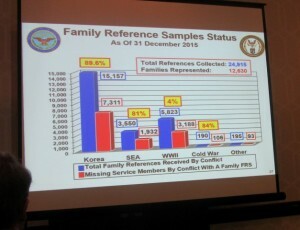 Some of the most devoted MIA families are those with loved ones unaccounted-for in North Korea, where the political challenges are the major problem, along with sorting out co-mingled remains that were returned years ago, before technology was available to accurately determine how to organize remains and make identifications. The latter is looking very promising these days, now that technology and anthropology have things under control. DPAAs mission may sound impossible, but like its predecessors, the agency continues to defy the odds. As an MIA family member, I am in awe of what they do. DPAAs job is big, as is the variety of expertise required to get it done. DPAA was prepared for the large turnout and arrived with enough staff and support personnel to demonstrate its professional approach and validate that the merger of DPMO and JPAC is working. The outlook for FY 2016 is in the agency’s favor. Enter DPAAs Director Mike Linnington — a one-man dynamo who is rapidly rebuilding the program, from top to bottom with style, as if he were made for the job. If you look at Linnington’s background, that may well explain his determination to restore faith in the system and get the job done, as he positions DPAA to meet the demands of the future. Having already secured buy-in from many influential partners on Capitol Hill and beyond – Dept of State, National Security Staff, Joint Staff, Casualty Offices, Armed Forces DNA Identification Laboratory, and more, Linnington made a point of stressing that DPAA is up to the job. “We made 48 identifications in October to December, 2015 — 200 IDs will not be a problem,” he said. Linnington’s remarks put to rest concerns about DPAAs ability to comply with the 2010 Congressional mandate calling for 200 IDs per year, which some people considered a make-or-break requirement for the agency. Applause filled the room, and with good reason. The importance of submitting DNA samples cannot be emphasized enough when it comes to identifications. Your DNA is protected!! Best of all, it simply requires a swab of your mouth. Throughout the event families were given total access to DPAAs team, which was one of the seemingly small touches that made a huge difference in the tenor of the meeting. I personally thought it was the best regional event I’d attended and would have no trouble complimenting Linnington and his staff, who had traveled from the D.C. area and/or Hawaii for a full day of presentations, etc. (L)Casualty Officer Hattie Johnson welcomes families whose loved ones served in the Marine Corps. Each of the Armed Services has a Casualty Office to support their respective MIA families. Casualty Officers are an important resource for families. 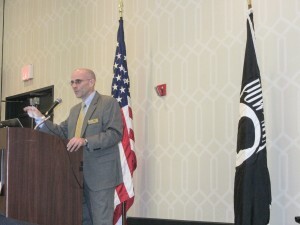 In addition to Linnington, there were several core team members who took turns at the podium, such as Rob Goeke, Communications Directorate; Jack Kull, DPAA Policy; Dr. Denise To, Forensic Anthropologist/Lab Manager; and Lt. Col Alice Briones, USAF, Director, DoD DNA Registry and others involved with break-out sessions, tailored to each wartime group. 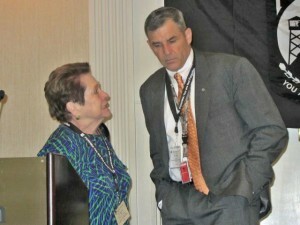 Rob Goeke is DPAA External Communications Directorate. 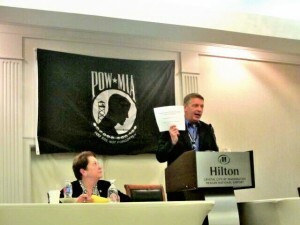 A retired Navy Commander, Goeke has been involved with the POW/MIA mission since 1994. He works closely with his team to provide outreach & support to MIA families. All were experts in their respective fields, speaking in terms that most of us could understand – for me, DNA is not a cakewalk, but Briones did an excellent job, and undoubtedly everyone learned the importance of submitting a DNA sample. 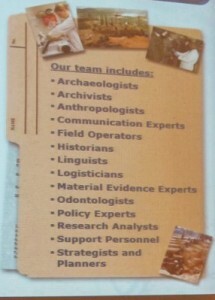 As a fan of field operations, especially excavations, I can say without reservation that Dr. To was as good as they come with the credentials and results to prove it. 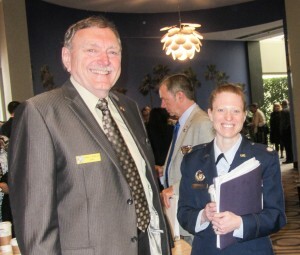 Johnie Webb, DPAA Outreach & Communications, has been involved with MIA wartime recoveries & identifications since the Vietnam War ended and scientific research began, eventually resulting in DNA, which has become a critical element in the identification of our missing service members. 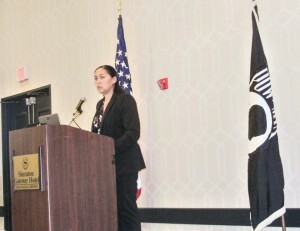 Lt Col Alice Briones, USAF, Director, DoD DNA Registry, uses cutting-edge, DNA technology to make identifications once thought impossible. Dr. Denise To, DPAA Forensic Anthropologist and Laboratory Manager, has done it all. A highly respected physical anthropologist including 22 years as an archaeologist, To’s work has spanned the globe — excavating the Pyramid of the Moon; teaching a human recovery course in Bogata, Colombia; responding to Hurricane Katrina; and responding to an aircraft crash in Kathmandu, Nepal — to name a few of her credits. It will come as no surprise that To oversees all field operations and material evidence analysis for the DPAA Laboratory. 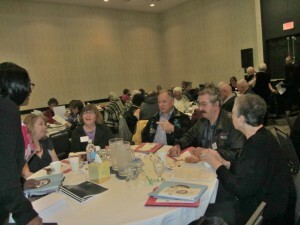 No matter how good presenters are at turning complex information into understandable presentations, it is no easy task to reach an audience of 80-90% first-time attendees, seeking information about family members lost as far back as WWII. This dichotomy was astonishing to me, and maybe even to Linnington, as well. 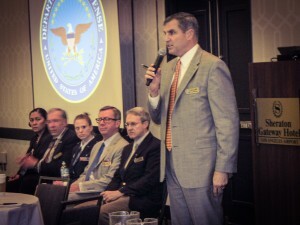 “We must be getting the word out,” said Linnington, knowing that the more families DPAA can reach, the better chance he has of educating them, up close and personal, of what goes on behind the scenes — one of the best ways of avoiding misconceptions about the mission. Perhaps equally important, Linnington is upping his own learning curve.